Water feature or aquarium – Now, you could go all-out with this one, or just install the basic (when we say all-out, we’ve seen things from staircases to functioning toilets become aquariums). Whether this is a fish tank in the middle of your lounge, or a continuously running fountain on your deck, the trickling sound is sure to soothe. You can create a colourful tropical fish haven, with brilliant blues to calm you. Or, make your shower into a rainforest waterfall — we kid you not, we’ve actually seen it on Pinterest. 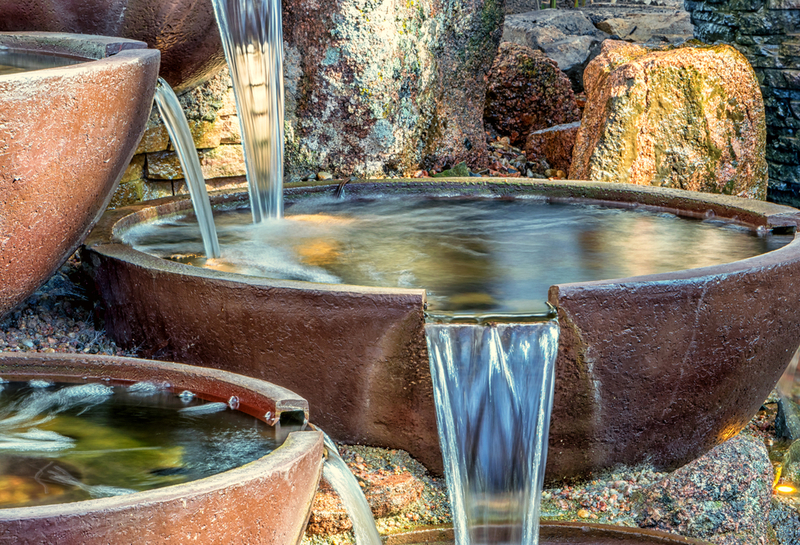 However and wherever you add your water feature or aquarium, will lift your life from hectic to Zen. Feature your filter – Adding a water filter/purifier to your kitchen is going to change your life. Not only is it better for the environment, helping you reduce your use of bottled water and encouraging you to fill your reusable ones. But, it will make your water drinking experience perfect every time. No more chalky residue to clear before your drink, or slightly funny taste. Plus, to really make sure it lifts your life, why not create a feature around it? Add character by using an old-fashioned sink with copper pipes, or have it sprouting out a garden cherub (you know the ones our grandparents/parents used to love back in the day). Get creative to turn something functional into fun. Mini water gardens and lily ponds in vases – Water gardens are so pleasing to the eye. They bring an instant bout of freshness to any situation and you can bring them to your home, no matter what the size of it. A simple vase with water and a lotus blossom / lily pad flower arrangement. Or shop for underwater plants in your local garden centre and immerse one in a large vase of water. Do you have a deck, balcony, or garden? If so you can create something as large as your space will allow. A small series of terracotta pots along the deck, or as big a pot as you can find in the middle of the garden. These can all be set up into mini water gardens. You can have a pond, without having a pond. And of course we recommend the addition of some water beads in your vases to bring in the bling, without breaking the bank. Use it to colour your kitchen counter – We all need water, that’s a given. Why not have some fun with it? Especially when you have guests over. Use fruit infused water to bring some additional colour to your kitchen counter. Or go for Stoneware Crocs, handmade on a potters wheel. For the fruit infused, use glass jars (the size it up to you) and fill them with the fruit combinations of your choice. You can experiment with colours and flavours, making it seasonal along the way. Watermelon and mint, or orange and berry. There’s so many to choose from. Article provided by Water People, Australia’s filtered drinking water experts.